Do you have plans for the weekend? This year I want to share more with you about London and some of its lovely places. We moved to London three years ago and we have been lucky enough to have time to explore the city and its surroundings. Today, I want to suggest you Holland Park, a green gem located near High Street Kensington and Notting Hill. As it is not so busy like others London parks, it’s quite enjoyable to get lost on the many reckons Holland Park has. As we still had sometime after shooting this look, I changed my mules for my Tubulars and we went for a walk in the park. Even with a little bit of rain, it was nice to spend some time away from the double deck buses and tube. 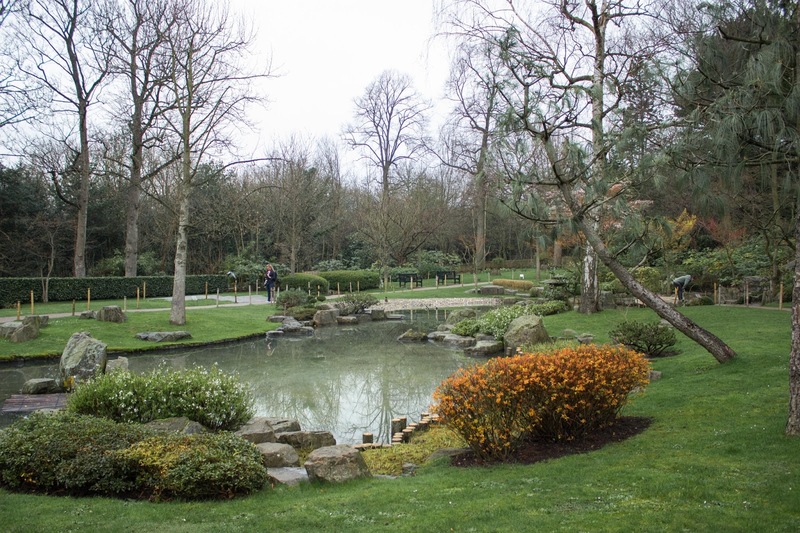 One of my favorite parts of Holland Park is the Japanese Garden followed by a walk on the semi-wild woodland. You will also be able to see the Holland House ruins, where we shot this and this look. In fact, we also shot this look on the woodland and this one on another garden. UAU! On your visit, you will find some wild animals and loads of squirrels strolling around. In the summer time I will recommend you to take a book with you and enjoy a reading in the park. Este ano quero começar a partilhar mais dicas convosco de viagens, especialmente de Londres. Já nos mudamos para Londres há quase três anos e temos tido a sorte de sonseguir arranjar tempo para explorar a cidade e outras regiões como a Cornualha (que é linda) ou Dover. Hoje quero sugerir-vos uma visita ao Holland Park, um jardim localizado entre High Street Kensington (Kensignton Place, Hyde Park) e Notting Hill (Portobello Market). Como não é tão movimentado como outros parques londrinos, fica muito fácil sentirem-se relaxados e explorarem todos os recantos do parque. Como ainda tínhamos algum tempo depois de fotografar este look, troquei as mules pelos meus Tubulars e fomos dar uma caminhada no parque. Mesmo com alguns chuviscos, soube muito bem passar duas horas longe da confusão. Uma das minhas partes favoritas do Holland park é o jardim japonês, seguido pelo passeio na floresta semi-selvagem, que faz na mesma parte do parque. Aqui também encontram as ruínas da Holland House, onde fotografei este e este look. Na verdade, também já tinhamos fotografados este look na floresta e este noutro recanto do parque. UAU! Na vossa visita não se admirem de encontrar alguns animais à solta e montes de esquilos a correr de um lado para o outro. No verão aconselho-vos a tirar um bocadinho de manhã para tomar o café no parque ou se estiverem com mais tempo, porque não um piquenique? You must be <a href="https://ararapintada.com/wp-login.php?redirect_to=https%3A%2F%2Fararapintada.com%2F2017%2F03%2Fholland-park-going-ou%2F">logged in</a> to post a comment.